When something feels right, it is often hard to describe why. You can dissect the most beautiful relationships, trying to work out the reasons why it works, but it usually leads you nowhere. Like Lennon & McCartney, Fred & Ginger or Bremner & Giles, there’s an undefinable magic sometimes that might look unlikely on the outside, so you would be advised to just sit back and enjoy it. There is something of that ‘stars aligning’ symbiosis about the partnership of Ossett Brewery and the Spiced Mango restaurant at Middlestown; a serendipitous ‘happy accident’ and a relationship that has grown naturally to bear wonderful fruit, rather than being a structured outcome from the minutes of an impersonal business meeting. Mohammad Ali, or Mo for short, is the owner of the Spiced Mango and he has built the business up over the last five years, since taking a redundancy package from his IT job and deciding to take the plunge and realise his dream in the restaurant business. Jamie Lawson, MD of Ossett Brewery, was a regular customer at the restaurant and their relationship grew from a mutual love of good food and good company. Pretty soon it became clear that the two should work together, but this was no unit-shifting corporate strategy, just a desire to follow a path that felt right and could continue the wholesome and natural image that both organisations hold great value in. 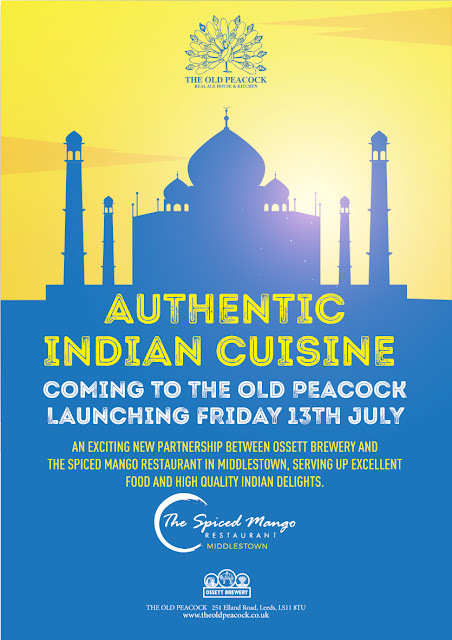 The partnership with the Old Peacock, which begins on July 13thafter a three-week re-fit of the kitchens at the famous Elland Road pub, is the first venture of its kind for the Spiced Mango and they aren’t planning to stray too far from what has been a winning formula at their Middlestown restaurant. Converted from the White Swan pub, the Spiced Mango has become one of the most successful Indian restaurants in the West Yorkshire area, winning a ‘Certificate of Excellence’ award from Trip Advisor for its consistently great reviews. And consistency is the key to the partnership with the Old Peacock, with Mo taking nine staff members and exactly the same menu with him to the Peacock’s kitchen, which is actually twice the size of the one at his Middlestown restaurant. So there’s really no excuse not to recreate the same magic down in LS11. A major factor in the discussions that led to the Old Peacock’s exciting new partnership with the Spiced Mango, was the pub’s identity as a famous landmark in the matchday traditions for generations of Leeds United fans. Mo won’t profess to being a Leeds fan, but he has ‘Leeds United sympathies’ through his father. However, it was made very clear that matchdays are a huge part of the Peacock’s business model and Mo has built that into the project the Spiced Mango are delivering. So Leeds fans flooding through the Peacock’s doors from August are in for a treat, and as if the pre-match build-up couldn’t get any better, they will now enjoy an Indian feast to go with their beer, live music and the amazing atmosphere that Leeds fans create. The clock is now ticking towards the grand re-opening of the Spiced Mango at the Old Peacock on Friday July 13thand with minimal internal décor changes, the concentration is on getting the kitchen fitted. All the equipment has been delivered, including a traditional tandoori oven, and everything will be in place for the big day. Certainly the stage is set for Mo and the Spiced Mango to make an impact in LS11. With no Indian restaurant in the area, there is an opportunity for a culinary revolution to hit Elland Road and for the Old Peacock to lead the charge into a new era. And with consistency at the heart of the Spiced Mango’s success story, there is every reason to believe that this new partnership with the Old Peacock will have people flooding to Elland Road, not just to walk in the footsteps of Charles, Bremner, Strachan and Viduka, but to sample the finest Indian cuisine in Leeds. When you get a summer like this, it feels like it can last forever. Usually we get a handful of hot, sunny days and occasional tea time periods where post-work folk like to bask in our sunny beer garden with a hard earned drink. This year, the steps outside onto our sun-scorched grass area have never seen so much action and every day feels like a holiday. Why do things have to change? Well, change is natural, it’s what makes life interesting and while we can’t stop the weather changing, there are certain things we can change because we think it will make life better, and that’s what is happening at the Old Peacock at the moment. It has been a fantastic summer so far, and while the country is bewitched by World Cup fever, England’s exploits in Russia and the multi-cultural festival of football, change is afoot here on Elland Road. All is pretty quiet over at Leeds United where everybody is busying themselves conscientiously in the build-up to the new season, while it’s business as usual on the pub side at the Old Peacock, where our regulars are happy watching the football and enjoying a beer as normal. But in the kitchen there are exciting things happening. On Monday June 25th our old kitchen closed, as we took the decision to leap into a whole new era. You may have seen the banners at the pub already and our posts on social media, but we are taking a three-week period out to refurbish the kitchens, update some décor and train the staff to welcome a whole new dining experience. Friday July 13th signals the start of a brand new partnership with the Spiced Mango Indian restaurant, which is based at Middlestown, between Wakefield and Huddersfield. We will be bringing authentic Indian cuisine to LS11 via an amazing menu that has proved to be a huge success at the Spiced Mango’s celebrated, relaxed and family-friendly signature restaurant. We are privileged that our new friends are sharing their expertise and amazing Asian flavours with us and we can’t wait to get started. As you know, for many years we have had weekly food events such as ‘Curry Night’ on Wednesday, ‘Steak Night’ on Thursday and a traditional ‘Sunday Lunch’ on Sundays. While these have been a great success and have proved very popular, we felt it was time for a change, and we hope people can understand and appreciate why. There is no doubt that the Old Peacock has never been so successful on a Leeds United matchday. We have got that formula completely worked out, although we are still looking at ways we can serve more beer to more people even quicker. So watch this space on that. Where we need to maximise our business is during the week and the many occasions whenLeeds United aren’t playing. Of course we have been very lucky in 2018 that the Leeds Rhinos have played at Elland Road twice, while Josh Warrington held his world title fight over the road and the England team also played their last friendly before the World Cup at Elland Road. These were occasions that we didn’t budget for, but unfortunately they are ‘one-offs’ and not something we are likely to see again any time soon. As a business, therefore, we need to look at ways to increase revenue on non-matchdays, and that thought process ended up with the nation’s favourite dish; curry. Quite apart from the fact that there is no Indian restaurant within four miles of the Old Peacock, our management team at Ossett Brewery have made a great success of pushing the boundaries elsewhere in the region, and challenging the conventions of what pubs and bars are supposed to do. Just a few miles away in Leeds city centre, the brewery took the bold step a couple of years ago of changing a winning formula at Candelbar in Granary Wharf. It had an identity as a bar selling fine ales, fine wines from around the world and fine pizzas. But a pioneering food partnership was formed with Edo Sushi, to bring exclusive Japanese cuisine to Candlebarand it has proved to be a great success. A similar approach has been taken with our new partnership with the Spiced Mango. The experts are taking over the food, while we look after what we know best; running one of the most famous pubs in Leeds. So things on the pub side won’t be changing one little bit, but you won’t be able to miss the unmistakable fragrances coming from the kitchens as the Spiced Mango serves delicious eastern cuisine in the shadow of Elland Road’s East Stand. Our new menus have been posted on social media already and you can start booking tables for July 13th onwards. We will be serving homemade sandwiches at lunchtime prepared on site by our staff, but from 5pm onwards, seven days a week, our kitchens will be serving exclusive and authentic Indian cuisine of the very highest standard. We have been assured that the guys at the Spiced Mango will have a takeaway collection service available too, and they have also prepared a great matchday food menu for Leeds United games; incorporating Chicken Tikka wraps, Seekh Kebab wraps and Biryani rice boxes (chicken or vegetable). All in all it is a really exciting development for us and we can’t wait to get started and make the Old Peacock one of the most popular venues in Leeds, not just on matchdays, but every night of the week. And with the new football season just around the corner and plenty of new faces expected at Leeds United, there is change everywhere and that’s just how we like it.